This recipe for no cook rocky road fudge is SUPER easy, and no fail guaranteed. 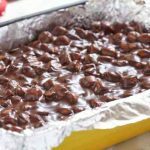 You can have your rocky road fudge ready in about 10 minutes or less, so it is great for a last minute candy or dessert to share. I have never brought any of this home when I take it to a holiday party or potluck! My grandmother loved rocky road ice cream…hence this was her favorite fudge. I love to make it and think of her enjoying her bowl of rocky road and watching Wheel of Fortune. Food has so many memories attached to it! 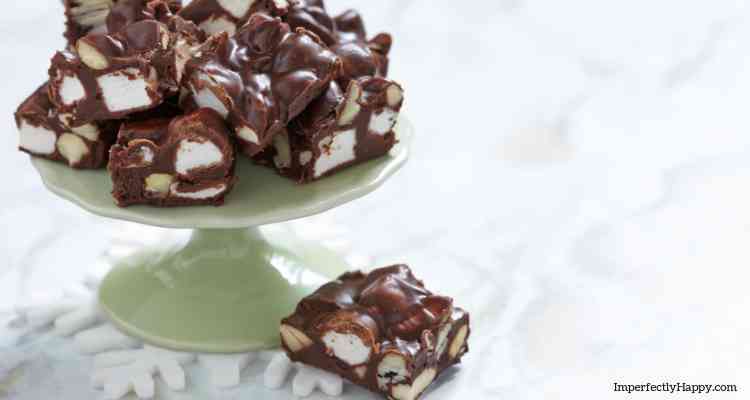 Now I make these goodies with my daughters; and a no cook rocky road fudge recipe is a great starter recipe for kids. Now I know traditional fudge making scares a lot of people (me included). Because cooked fudge is pretty easy to mess up; I have made some fudge that could not be eaten, in my early cooking years. You Cannot Fail with No Cook Fudge! 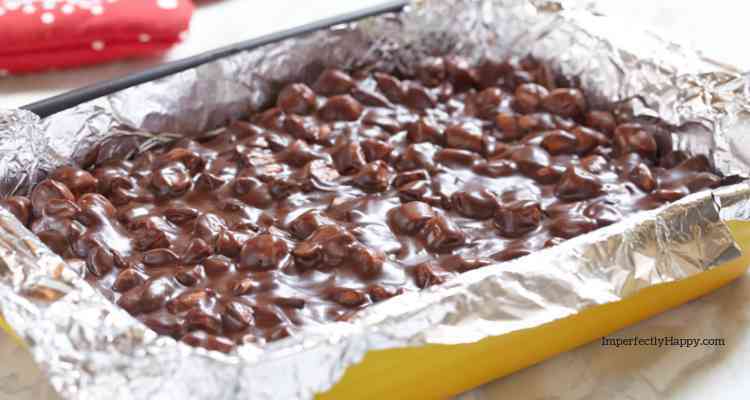 But not with this no cook rocky road fudge! You are going to look like a champion chocolatier my friends! Not only is this recipe, no cook, no fail fudge; you can really customize it to your tastes. I like semi-sweet chocolate best but you can switch up the recipe and use milk chocolate, if you prefer that. I have always wanted to try a white chocolate version of this but I haven’t yet (if you do let me know what you think!). A note on the nuts: I love the fudge with almonds but it is equally good with peanuts, walnuts, macadamia nuts or what use a combination of your favorite nuts. I tend to use a salted nut but you certainly could sub a non-salted version if you’re watching your salt in-take. VARIETY IDEA: Take out the nuts, and some graham cracker pieces and now you have S’more Fudge!!! With 5 simple ingredients, this fudge is not only easy to make, it is affordable too. Make a few batches to share with family, friends and neighbors; but be careful because you’ll get requests for it next year! These little morsels look wonderful plated up with your favorite cookies ( See Vintage Cookie Recipes ) at your holiday gatherings too.Be sure to check out my Vintage Pie Recipes too! Line your 13x9 baking dish with foil or parchment paper. For best results, if you use foil, lightly spray non-stick spray. To a large pot add your chocolate chips and sweetened condensed milk. Set your stove top burner to low. Melt the ingredients together, continuously stirring to prevent scorching. Once mixture is completely melted and smooth, remove from heat and add vanilla extract. Fold in your chopped almonds and marshmallows. Spread the mixture out, evenly, into your prepared baking dish. Put in the refrigerator and allow it to competely chill and harden. Once hardened remove from your pan and cut into 24 pieces. Store in air-tight container, I keep mine in the fridge. 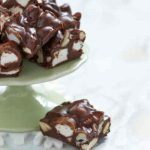 I hope you love this rocky road fudge recipe as much as we have over the years. What are your holiday favorites to make? 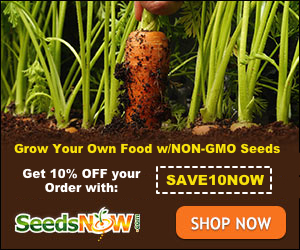 Leave me a comment and share! Want more candy recipes? Check out Old Fashioned Candy Recipes from Food Storage Moms or From Scratch Holiday Cookbook – Featuring Einkorn Flour: Easy to Make, Delicious Holiday Recipes.